In the eight years that I have now been actively buying, selling, and repairing/restoring cameras, I have seen almost all the classic folders that existed between 1933 to 1970, and ask I’ve indicated earlier – there are veru few that I didn’t like, and none that couldn’t perform well after restoration. Recently I ran into a camera I didn’t even know existed (well, actually, there’s quite a number I have yet to hold in my hands). 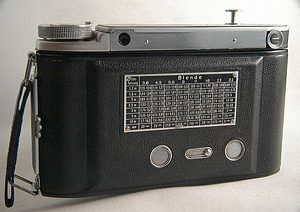 This was the 6×9 Pontura camera from Balda. 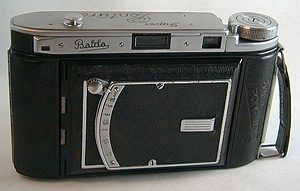 By the late 1950’s Balda was making mostly mass market cameras that were not particularly innovative or “high end” (think Zeiss, Voigtlander, or Leica), but rather mass market cameras meaning inexpensive and using lighter materials (sheet steel rather than castings or brass). 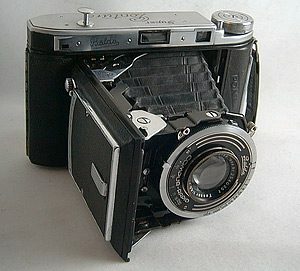 However, before WW II Balda exhibited cameras of high ingenuity, quality construction, and features that could hold their own against the likes of Zeiss, Voigtlander, and Weltur. The epitome of those ventures brought forth the Super Pontura (6×9), the (6×6), and the Super Baldinexette (35mm)! Today these cameras are pretty rare, especially here in the US – and almost as rare in Germany. The Super Pontura above I found on eBay (wasn’t cheap!!) and was in surprisingly excellent +++ condition cosmetically. Usually, if you find one, the condition is a bit “weathered” and “worse for wear.” However, this one was extra-ordinarily NICE! It did, of course, have its age-induced maladies and needed a complete service to put it back into commission (what’s the point of a camera if it does not function correctly?!). 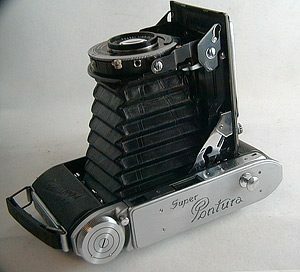 What is so nice about the Super Pontura is that is a fully featured 6×9 folder on the order of the Voigtlander Bessa RF, the Zeiss Super Ikonta C, and the Welta Weltur 6×9. It was available with a Tessar f3.5/105mm lens (all 6×9’s are 105mm) in a Compur-Rapid shutter, coupled rangefinder with parallax correction, and focus via the whole lens group rather than just focus via the front element – also like the Weltur and the Bessa RF and its immediate successor, the Bessa II. Build quality was superior with chromed surfaces and excellent materials and workmanship. It was meant to be for the demanding photographer who didn’t mind paying for a quality piece! It’s only a shame that so few were produced and fewer still survived for us today! Awesome folder!